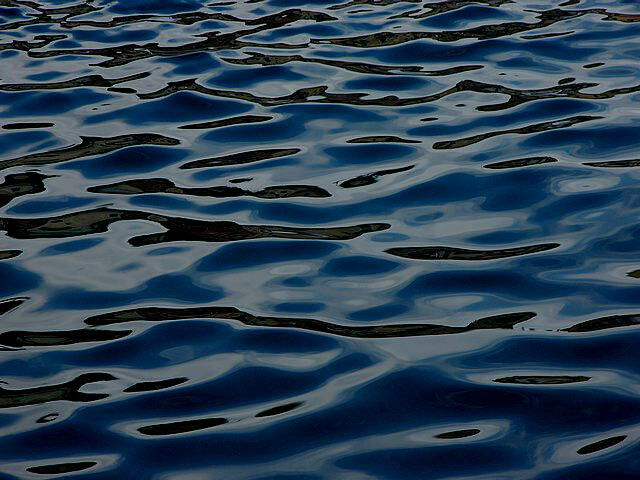 which requires that anyone born on or after January 1, 1988 must pass an approved boating education course to operate a motor vessel of 10 or more HP within the State of Florida. 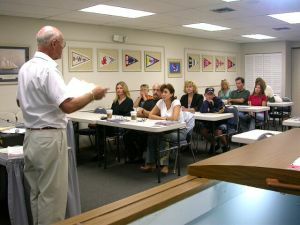 "America's Boating Course" course is taught to the public, twelve times a year in our Headquarters building, 1125 Old Dixie Hwy., Lake Park, Florida (1/2 mile south of Northlake Blvd). This course is offered to promote public awareness of the dangers on the water and to teach safe and proper skills. The certified instructors are volunteers from Palm Beach Sail & Power Squadron. ● Required equipment, navigation lights, boat registration, law enforcement and Florida regulations. ● Aids to navigation, navigation rules, emergencies including use of VHF radio. ● Review of homework, overall review, final exam and awarding of certificates, membership interviews. The course is open the public, 12 years or older. Successful completion of this course will qualify that person to obtain a Florida Boating Safety Education I.D. Card. You do not have to own a boat to take this course, however, if you had to handle someone else's boat in an emergency, would you know how to cope? Take the course, learn form the experts. You never know when that bit of knowledge will become useful. Registration is at 7 pm Tuesday evening. Cost is $30 per person payable at registration. Class begins immediately after registration and will run until 9:30 PM. On the third evening there will be review, exam (60 questions) and squadron orientation. Registration is at 7 pm. Class begins 7:10 immediately after registration. Cost is $30 per person payable at registration. Class begins promptly after registration and will run until 9:30 pm. On 3rd evening there is a review, exam (60 questions) and squadron orientation. Location: Courses taught at our modern, learning enhanced headquarters building. 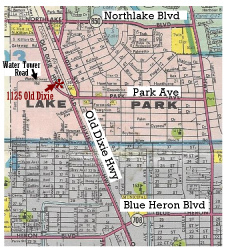 Directions: From I-95 exit 77: East on Northlake Blvd. to Old Dixie (traffic light before RR tracks) and turn right. 1125 is 0.6 mile South on left. There is a tall microwave tower at the south end of our building.